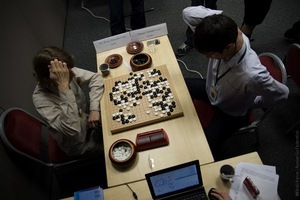 While the clash of titans in the final match at the St. Petersburg Go Consul Cup League A (Dinerchtein’s “Water” Douses Shikshin “Fire” at St. Petersburg Go Consul Cup 4/14/2013 EJ) naturally generated the most general public hullabaloo, the Cup’s B League — consisting of 86 players ranging from 6d to 15k — offered plenty of excitement and surprising results as well. Thousands of go events around the world routinely show that the game can unite people and draw them together. Shared common interest in go can create the most loyal friendship and, it turns out, love. 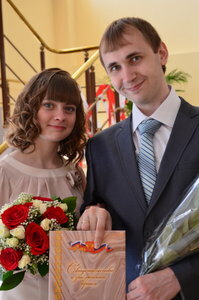 This is the case of Igor Burnaevskiy 4d and Dina Burdakova 5d, the young Russian married couple who took the two first places of the League B event; Igor managed to defeat Alexey Lazarev 6d, the first Russian player who won European Go Champion Title in 1991, thus leaving him in the 3rd position in League B. This success is quite unique. We’ve heard of Asian pro marriages but Dina and Igor (at left) are the first and only European high-dan married couple. Dina Burdakova has been playing go since childhood and is an acknowledged Russian go-star, three times Russian Female Champion, winning this title for the first time in 1999 at the age of 12. Husband Igor Burnaevskiy, in contrast, can be called “the dark horse” of this tournament. He started playing go about 6 years ago after watching “Hikaru no Go” and reached 5d on KGS without playing in any major go competitions. He appeared in real tournaments only in 2011. The couple’s secret lies not only in go training but in shared experience and merging the strong points of their different styles. The drama of the Go Consul Cup League B sprang up in the final round when they had to face each other in a match to determine the winner. Here Igor showed his stronger side – the feeling of fuseki – and drew the game to the victory. In any case, the result allowed both spouses to pass to the League A (top 8 with rotation system) and we’ll see them competing with Russian top players at the next Russian grand event.